Jerry’s article talks about the regional economic disparities that have left Trump-voting regions (and rural parts of Clinton-voting regions) behind, and the political consequences of those disparities. The Dow Jones Industrial Average reached an all-time high of 26,616 points on January 26 of this year. That was after rising almost 8,000 points since Donald Trump’s inauguration. The Dow then fell over 2,700 points in early February, which met the technical definition of a market correction—a drop of at least 10% from a recent high. Since then, the Dow and other indices have gone up and down, but mostly up, since the correction. In the second part of her three-part series on deindustrialization in Keene, N.H., Marie Duggan gets into more detail about the adverse effects of a financialized economy, and its tendency toward financial bubbles, on workers. The story of how a local company, Miniature Precision Bearings, was acquired by a much larger company, Timken, shows how asset bubbles and financialization have contributed to deindustrialization and job loss. When management spends its accumuated capital manipuating stock price, the math means there will be less capital available for investment in the equipmient and people to produce quality product. The financial bubble of the 1990s seemed so great at the time with the rising value of pensions, but it turns out that the market wasn’t raising funds for industry, but rather was persuading industry to abandon product quality and investment in the company, workers, and community. The backstory of the decline of rural America may be the giant sucking sound of the stock market removing funds from the industrial base into stock price manipulation, given the 1990s bubble. This is all the more ominious, given that the rise of the stock market under Trump gives every appearance of being a bubble itself. Gerald Friedman’s Economy in Numbers column in this issue tells a related story of regional economic disparities and their political consequences. As Friedman points out, federal policies favoring Wall Street have been better for urban areas on the coasts, but have contributed to deindustrialization and lagging income growth in other regions (and, as we see from Duggan’s article, non-urban parts of coastal regions are also falling behind). Both political parties’ embrace of neoliberalism has eroded the safety net and has neglected industrial policy. This issue’s cover story suggests an alternative understanding of finance and monetary policy that could point to a way out of neoliberal economic policies that have led to these regional disparities and to widening inequality. 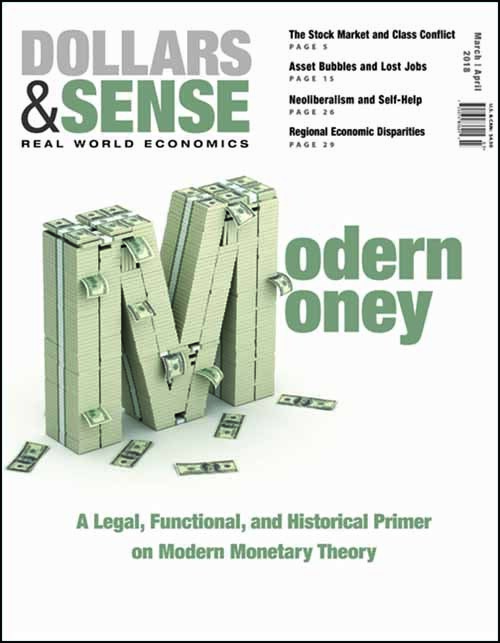 Modern monetary theory (MMT) addresses the connection between lending (and debt) and money, and undermines the standard views of taxes and deficits that justify austerity policies. MMT points to a way to stimulate the economy by providing the finance and credit people need to buy products, and that businesses need to be able to sell their products, and in that way moving economic policies beyond austerity and deficit fear-mongering. The MMT approach could finance government policies—including infrastructure spending, direct job-creation, national health care, and industrial policy—that would lead to full employment and greater equality. Also in this issue: Arthur McEwan tallies up the economic costs of Puerto Rico’s ongoing crisis, Noah Berlasky lays bare the neoliberal foundations of the self-help literature, and more! Next Next post: Is The US Hypocritical To Criticize Russian Election Meddling?